Known as the land of a thousand hills, Rwanda is a small country of about 12 million people in East Africa. Its landscape is covered in lush green vegetation and rust-colored dirt, opposite a deep sky and heavy clouds. There is an order and cleanliness to its capital, Kigali, that serves as a contrast to most other large cities around the world. On the paved, winding streets the cars drive at an easy pace. Pedestrians line the streets and moto-taxis carry passengers on the backs of their small motorbikes. There is no trash on the ground. There is the feeling that nobody is in too much of a hurry. Valleys stretch into the distance until another hill rises up. If you let your eyes search through the thin mist in the distance, you can see hill after hill after hill. The charm of this place, however, is marred by a history of division, hate, and violence. It was only 24 years ago that Rwanda emerged from a 100-day period of mass killings amounting to genocide of the Tutsi people. The official number of fatalities is estimated between 800,000 and one million, but the exact total remains unknown because many were dismembered beyond identification and bodies were dumped so widely, often in rivers and swamps. Human remains are periodically discovered to this day. Every Rwandan, whether they lived in the country through the genocide or not, was touched in some way by the violence and instability. Most lost family members. Others had family and friends who committed murder. Neighbors were betrayed by those whom they had lived with for generations. Meanwhile, refugees watched the destruction of their homeland from across East and Central Africa, having fled violence in Rwanda decades earlier. In 1959, Charles’s mother and father fled the country during what is considered to be Rwanda’s first genocide. They met and married in Uganda and started their family there. Though they escaped genocide, Charles’ childhood was not easy. As a minority, he experienced discrimination from a young age and grew up an outsider. Uganda was unstable, and the civil war scarred his childhood with trauma and uncertainty. His family moved frequently, often in order to escape life-threatening situations. Charles was raised as a dedicated Catholic and always loved church, even thinking that he might one day become a priest. But at the age of 17, after begrudgingly accepting an invitation to a local Protestant church, he discovered what it meant to have a personal relationship with God, a relationship that didn’t require confession through a priest or prayer through the saints. He had become frustrated with the hierarchy of his childhood church and in this new setting of worship, Charles found a group of people who embodied a faith without barriers. This direct access to God changed everything for him. It started him on a journey of service and preaching the Gospel that took him all over the world, but ultimately, back to his home country of Rwanda. On the peak of one of the many Kigali hills sits the headquarters of Africa New Life Ministries (ANLM). Walking through its sprawling campus, called the Dream Center, one feels a sense of hope and progress. Located on the campus and a few nearby locations is the Africa College of Theology (ACT), New Life Bible Church, a child sponsorship office, a coffee shop, a sewing and beautician school, a daycare, and a medical center in its final stages of construction. It’s hard to imagine that this flourishing community started with one family returning from exile, trying to serve a few orphans with the love found in the gospels. Pastor Charles is the first to say that what God has accomplished through this organization stretches far beyond what he could have ever hoped for. This experience laid the foundation of ANLM long before the organization existed, and it is still the core principle of the ministry today. At that time, though, Charles didn’t know where to begin. He didn’t have any models of ministry to follow that would show how to integrate compassion ministries and preaching the Gospel. 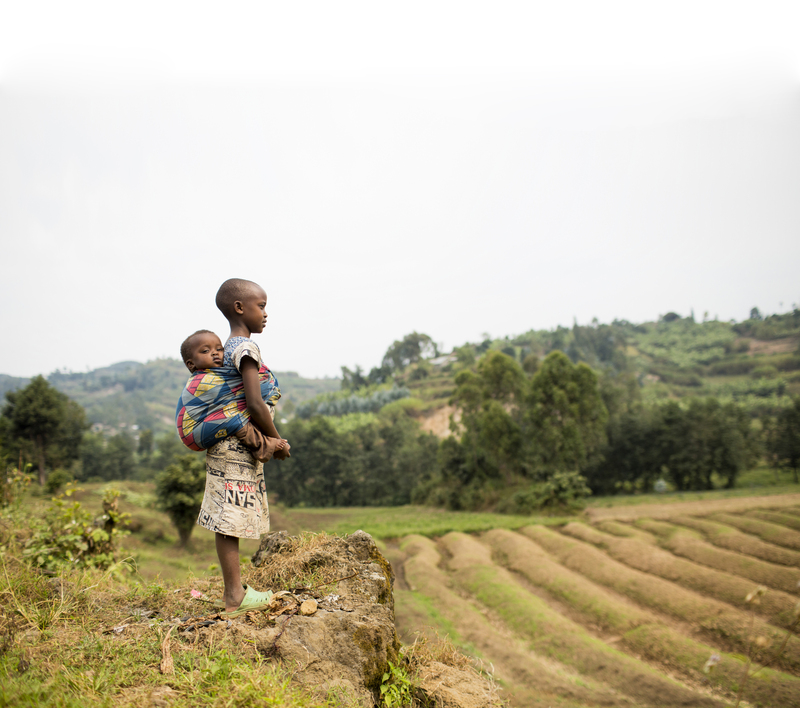 He and his wife Florence began where they could: by investing in the people of Rwanda. They started sponsoring nine children and paid for their education. 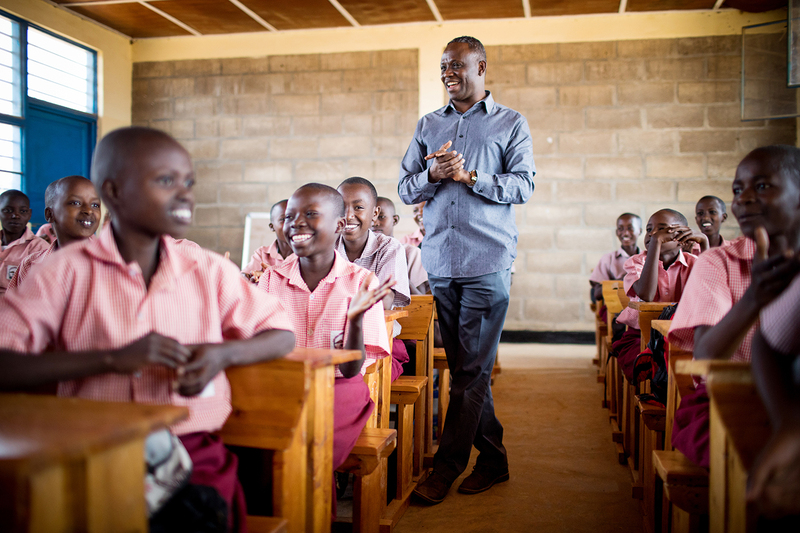 Charles finished his bachelor’s degree in Uganda and wanted to return to Rwanda immediately. However, as he prepared for the journey, he became increasingly uncomfortable for reasons he could not explain. He eventually realized that God was nudging them to wait—the time was not right yet. Full of zeal for the Gospel and for helping children, he didn’t understand that God was preparing them for much more than they imagined at the time. Charles and Florence needed more training for what was ahead. 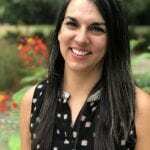 The first step of this training was completing degrees at Multnomah University in Portland, Oregon, where Charles studied Ministry Management and Florence pursued a degree in Family Ministries. Despite their initial reluctance to move across the world, God guided both Florence and Charles toward Multnomah through a series of open doors. Their visas to the U.S. were approved immediately, supporters provided tuition money and a place to live, and they formed a strong network of friends in Portland who would eventually become a vital part of ANLM. Even when they were based in the U.S., Charles and Florence returned to Rwanda often to prepare for their future work. Using the money Florence had saved from babysitting, they started a small preschool in Kayonza, a town less than an hour away from Kigali. Charles had previously worked for Compassion International and used his experience to start a small child sponsorship program. 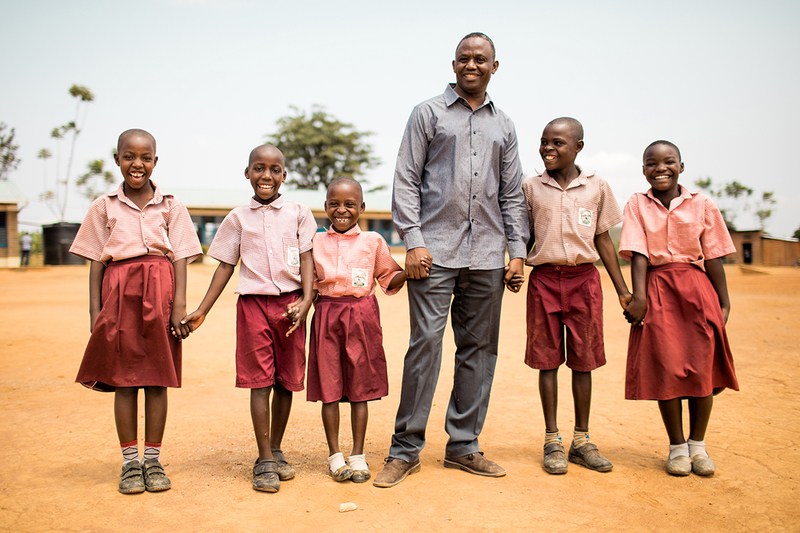 He took a photo of each child in the Kayonza school, created profiles, and brought these back to the U.S. to find sponsors. By the end of his master’s degree program, Charles had a formed a business plan, and Africa New Life Ministries was born. After years of waiting, hoping, and praying, Charles and Florence and their growing family finally moved to Rwanda in 2003. Building on many years of small, obedient steps, ANLM has since flourished into a nationwide ministry sponsoring over 9,000 children. The small preschool started with Florence’s babysitting money, New Life Christian Academy, now sits on a sprawling campus with both a primary and secondary school, a church, several homes and dormitories where students live, a science lab, a football field, and high academic standards. Students at New Life Christian Academy consistently test among the top schools in the nation. In both Bugesera and Kageyo, the government has chosen to partner with ANLM, giving the ministry the opportunity to run the operations of the local primary schools. Churches and child sponsorship programs thrive in each of these locations. On the edge of Lake Kivu, which borders the Democratic Republic of Congo, ANLM’s most recent branch has sprung up with a church, school, and sponsorship office. And the Dream Center in Kigali—the flagship of ANLM—provides spiritual nourishment, vocational training, scholarships, and child sponsorships to the people of Rwanda’s capital city. Lydia Kayitesi, Pastor Charles’ personal assistant and an ANLM scholarship recipient, says that he can look at an empty field and, where others would see nothing, envision what could be: a school, a church, a hospital. This gift has served him well but it is not enough on its own. If it had been up to him, he would have gone to Rwanda much earlier. He would have never moved abroad to Oregon; he would not have received the nonprofit management skills his master’s degree provided that have equipped him to lead a large organization. He and Florence would not have formed the network of people who now constitute the American board of ANLM and who play an ongoing vital role in the ministry, both by fundraising and engaging sponsors and by bringing short-term missions groups to Rwanda each year. Reflecting on his story, Pastor Charles is quick to acknowledge that none of this would have happened without God’s leading and provision. “[W]e’re going feed the hungry, we’re going to take care of the poor, but we need to do it in the name of Jesus, because if we don’t do it in the name of Jesus, then we’re building our own monuments, idols of actually what we can do for the poor. But it’s not about us, it has to be about God,” he says. When he thinks about the future, he sees continued growth and expansion for the many facets of ANLM’s ministry. He wants to support churches throughout the country, creating “healthy churches rather than megachurches.” But his plans stretch beyond building structures and programs. He envisions mentoring future leaders and creating models so that the work of ANLM—combining compassion ministries with Gospel teaching—can be replicated. He wants to spend more time in contemplation, thinking through challenges and listening to God. “When you start to focus on people, developing people instead of building buildings and churches, it turns into redemptive leadership,” he says. 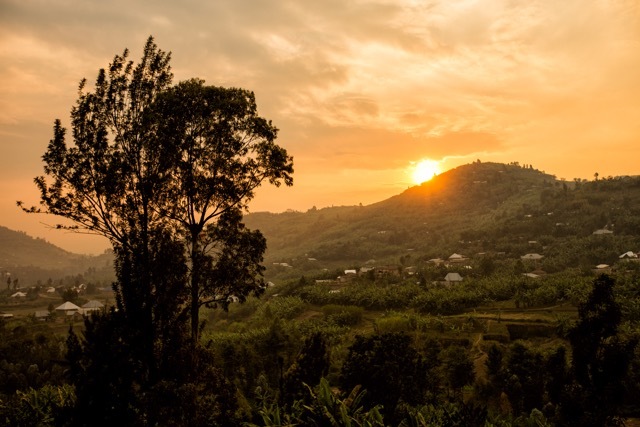 Walking around the Dream Center campus, driving through Rwandan’s verdent countryside, and listening to stories of lives changed through ANLM, it can be easy to forget that this ministry’s history is one of of pain and resilience, desperation and faith, prayer and obedience. Charles and Florence serve a country that, for all its recent economic and social success, has roots in the deepest imaginable pain. 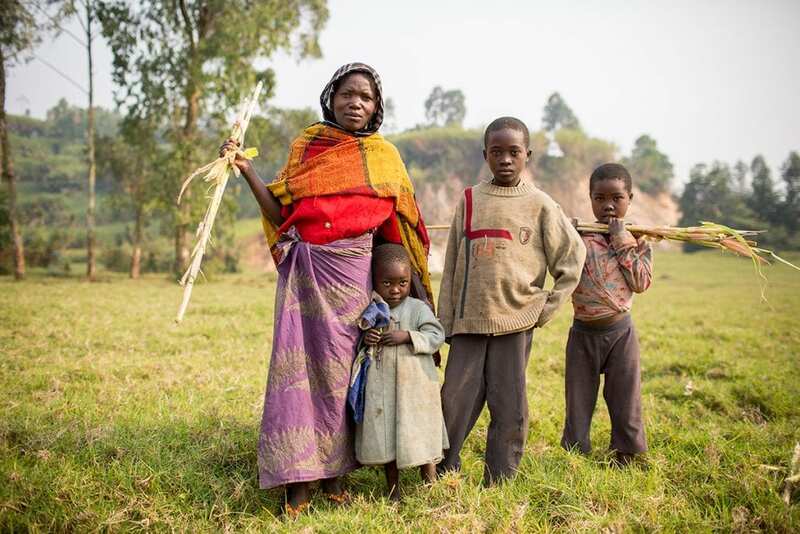 Rwanda still has orphans and widows. There are still those who are unable to pay for their education, and others desperate for healing. The core mission of Africa New Life Ministries is to preach a holistic Gospel. “If you really focus on the ministry of Jesus Christ: [he] preached the Gospel of the kingdom to come, healed the sick, he fed the hungry, he assisted the poor, he said, ‘Let the little ones come unto me,’” Charles says. “If Jesus was in my city, possibly he would have a small Christian school to let the kids come and learn from him.” That is the model Charles and Africa New Life Ministries follows: the full and complete Gospel of Jesus, the ministry of two hands.